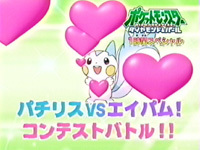 Japanese Episode DP 022: "Pachirisu vs. Aipom! Contest Battle!!" American Episode 486: "Borrowing On Bad Faith"
Satoshi is training for his upcoming gym battle one day when his Aipom takes his hat and runs off with it! The monkey pokemon is too fast for Satoshi and loses its trainer before ending up stranded on a rocky cliff! Musashi-tachi, who had just happened to be passing by, notice the Aipom in peril and decide to help it. After saving the pokemon's life, Musashi learns that the pokemon belongs to Satoshi! The young trainer thanks the Rocket-Dan member, but Musashi declares that his gratitude isn't enough! She demands to be given the opportunity to compete with Aipom in an unofficial Pokemon Contest being held in a nearby village, so Satoshi reluctantly agrees. Satoshi keeps a watchful eye on Musashi and Aipom during their training but finds nothing suspicious. The Contest begins, and Hikari is the first Coordinator up. Her Pachirisu, after getting over a bit of stage fright, accidentally electrocutes the entire audience with a Discharge attack! Hikari thinks her chances of getting into the next round are slim to none, but luckily for her, the rest of the competition isn't so great. After Musashi and Aipom dazzle the crowd with a combination of Double Team and Swift attacks, it is declared that both Hikari and Musashi will move on to the second round. As the second round goes underway, Satoshi becomes worried that his Aipom might like Musashi better than it likes him. Musashi and Aipom eventually win the battle and claim the prize of a year's worth of bananas! As the Rocket trio make their exit, Aipom starts to chase after them, confirming Satoshi's worst fears! However, it is soon learned that Aipom only helped Musashi out to get its paws on the bananas! After sending the Rocket-Dan blasting off again, a relieved Satoshi rejoins his Aipom on the road to Sono'o Town. This episode reminds me a lot of that "Pikachu's Entering the Rocket-Dan!?" episode from Advanced Generation. Only this time, instead of the clichéd amnesia bit, we get a legitimate reason for Aipom to join up with the Rocket-Dan. It also helps the whole "Aipom really likes Contests" thing the anime's been doing for a little while now, instantly making this episode more valuable to the series than that Houen filler was. We also get to see Musashi win a Contest for the first time, but the fact that it's an unofficial Contest and she doesn't even get to keep the prize she earned is pretty lame. Is it really too much to ask to give the Rocket-Dan a happy ending every now and then? For some reason, the dubbed version refuses to call the bananas by their name, instead referring to them as fruit. When I noticed this, I thought PUSA was going to make some DP 007-esque joke, but they didn't go that route. Weird. PUSA keeps an astounding (for them) eight pieces of Japanese music, so that's worth noting as well. The last shot of the episode is a few seconds longer in the dub as it is in the Japanese version.